An alleged switch of patients on a liver waiting list is at the heart of an eight-count indictment in California. (CNN) -- On Wednesday, a federal grand jury indicted the former director of the liver transplant program at St. Vincent Medical Center in Los Angeles, California, for allegedly lying about a liver accepted for one patient but transplanted instead into another patient who was lower on the waiting list. Dr. Richard R. Lopez Jr., 54, of the Cheviot Hills area of West Los Angeles, was named in the eight-count indictment, which accuses him of conspiracy, concealment of a material fact and six counts of falsification of records, the U.S. Attorney's office for the Central District of California said in the indictment. The alleged incident occurred in September 2003, when the hospital was offered a liver for one of its patients, identified as A-H. Patient A-H was second on the match list because of his poor condition, but he was in his home country of Saudi Arabia, the indictment said. The next patient listed for the liver was at another area hospital, it said. Instead of telling the organ procurement organization of the switch and letting the organ be offered to the backup patient, Lopez approved acceptance of the liver and its transplantation into A-B, a patient at St. Vincent, the indictment said. A-B was ranked 52nd on the match list behind nine other St. Vincent patients, it added. After A-B got the liver, Lopez and his co-conspirators falsely told authorities at the United Network for Organ Sharing (UNOS) -- the private, nonprofit organization that contracts with the Department of Health and Human Services to allocate donated organs -- that A-H had received the liver, the 19-page indictment says. Lopez later submitted a falsified pathology report on A-H's removed liver, it added. That led officials to remove the ailing A-H from the wait list, even as Lopez was telling the man that he was still on the list, the indictment said. In April 2004, Lopez told A-H to return from Saudi Arabia to the United States, which he did, it said. But by that time, A-H was too sick to undergo a transplant, so he returned to Saudi Arabia, where he died, the indictment said. The indictment further alleges that Lopez and unnamed co-conspirators asserted in reports filed until 2005 with UNOS that A-H had in fact received the transplant. That year, management at the hospital discovered the switch and cover-up and told authorities, it said. "It came to light after UNOS did a routine audit," said Consuelo S. Woodhead, assistant U.S. attorney, major frauds section, in a telephone interview. A new administrative head of the hospital's transplant program "basically discovered that he [A-H] had not been transplanted and she reported it to upper management, and upper management reported it to UNOS," Woodhead said. Asked what might have motivated Lopez, she said, "I really can't comment on that." She noted that the charges stem from the alleged cover-up, "not from the decision to make the switch." Though it appears that, in making the switch, Lopez violated UNOS regulations, federal authorities did not address whether those violations rose to the level of a federal crime, she said. "The system that's in place is a very admirable system, if people would play by the rules, because it is a system designed to ensure equity in the allocation of livers," she said. "It sets us apart from countries where people literally traffic in these organs for money. It is a system very worth protecting, but the integrity of the system depends first and foremost on people being honest with the system. If you actually lie about who got a liver, that's a really fundamental perversion of the system." St. Vincent cut its ties with Lopez in 2005 and ended its liver transplant program in 2006 as a result of the incident, said Sharon Greengold, director of marketing, in a telephone interview. Lopez's lawyer, James T. Duff, said he had not read the indictment, but denied that his client had falsified any documents and said Lopez's decision to transplant A-B was based on medical need. 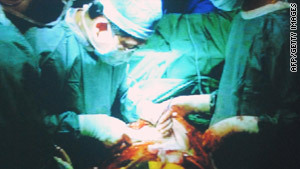 "A medical decision was made that that individual was going to die, and if a transplant was not made he would have died. That individual is alive today because of the transplant." A UNOS spokesman did not immediately return a call seeking comment. The hospital has cooperated with authorities in the investigation, the U.S. Attorney's office said. In a written statement, the hospital said it was "pleased that the federal prosecutors have concluded their investigation, and that the actions of a rogue physician, acting outside of the scope of his duties and hospital policy, were criminal in nature." Lopez is scheduled to make his initial court appearance in U.S. District Court in Los Angeles on January 25. If convicted on all eight counts, he faces a maximum penalty of 130 years in federal prison. The case was investigated by agents from the Department of Health and Human Services, Office of Inspector General and the FBI.